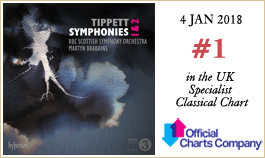 Tippett’s first two published symphonies are mature and confident works dating from the middle of the last century. Coruscating accounts from Martyn Brabbins and the BBC Scottish Symphony Orchestra are sure to win new friends for this marvellous music. Nearly forty years of Michael Tippett’s long life (1905-1998) had passed before he finished the piece now known as his ‘symphony No 1’. To outline them briefly: his well-heeled childhood in deepest Suffolk had been comfortable but interrupted by jabs of trauma, not least the First World War, which ruined the family finances. Tippett’s schooling was darkened by sexual abuse from older boys, and by his growing awareness, even as a teenager, that—homosexual, pacifist, left-wing—he was swimming against the stream of the society into which he’d been born. He enrolled almost by accident at the Royal College of Music, not as a result of any innate musical aptitude, but with a determination to respond to political and psychological turmoil through art. He nevertheless resolved to master the craft of composition, and master it he did, but only after a long apprenticeship. An undistinguished RCM career led him to return, two years after graduation and determined to iron out his compositional weaknesses, for a further bout of lessons in counterpoint. He was in sympathy with neither the Vaughan Williams pastoral school in England, nor the serialist techniques emerging from Vienna. Still unknown as a composer and making a small living as a choral conductor, he devoted himself to working out his own musical language. In 1933, after two abortive attempts at a symphony, he completed his symphony in B flat, in which his passion for Sibelius sounds clearly. Rather too clearly, Tippett subsequently felt, and eventually withdrew the work. Soon after the symphony in B flat, his string quartet No 1 (1935) displayed for the first time and in all its originality the seductive rhythmic gallop of his mature compositional voice, combining a spikiness redolent of Bartók and early Stravinsky with the syncopation of jazz and the techniques of Tudor and renaissance music. Symphony No 1 was premiered by the Liverpool Philharmonic Orchestra, conducted by an under-prepared Malcolm Sargent, on 10 November 1945. But it made little impact, and in fact received fewer performances in the years after its composition than the symphony in B flat had done. In the eleven years that passed before Tippett wrote another symphony, he completed the opera he had long wished to write, The Midsummer Marriage (1946-52). The work has since been acclaimed as a masterpiece, but an unhappy first production received decidedly mixed reviews, and the view began to circulate that Tippett was nothing but a bungling amateur. Novel effects in his music that subsequent performers have triumphantly realized were dismissed as evidence of poor technique and a tin-ear, and none of this was helped by his piano concerto (1953-5) being declared impossible by a number of distinguished players (although, by the premiere, pianist Louis Kentner had committed the solo part to memory). It was in this prevailing wind that Symphony No 2 (1956-7) was composed and premiered. Adrian Boult led the BBC Symphony Orchestra in the first performance, on 5 February 1958. Within a few bars, the performance broke down, and Boult—gallantly taking the blame—had to start again. The leader of the orchestra had found Tippett’s notation eccentric and between the final rehearsal and the concert re-grouped the string parts, an intervention that has since been blamed for the collapse. Careful attention to an archive recording of the premiere seems to indicate that an early flute entry, giving a false cue, brought the whole orchestra down on top of him, and threatened to pull Tippett’s reputation down with it. But memories of the disastrous premiere should recede in the face of the work itself, the reputation of which was rejuvenated by Tippett’s great advocate Colin Davis. Like its predecessor, Tippett’s second symphony is in four movements, each of which, still in his post-war dedication to expressions of jubilation and renewal, the composer linked to a specific state: joy, tenderness, gaiety, and fantasy. The symphony is a work on the cusp, full of the rhythmic exuberance and lushly scored exultation of sound worlds he had made his own in The Midsummer Marriage, but already taut with the harder-edged building blocks of forthcoming works such as his second opera, King Priam (1958-61). Listening to a passage of Vivaldi with pounding Cs in the bass marked for Tippett ‘the exact moment of conception of the second symphony’. And so, in the first movement, the first subject bursts into life with a thump of quavers on a low C (given a percussive sheen by the addition of a piano). Gyrating strings then romp in above, resolutely accented on the ‘wrong’ beat. As so often in Tippett, the achievement is that such seeming missteps make the music dance rather than limp. A second subject is introduced, of graceful, elegiac woodwind, polished to a sugar-plum-fairy sparkle by the celesta. The two subjects are spliced and intercut within an overall sonata-form framework, and build the dialogue of contrasts inherent to so much of Tippett’s music, the friction between them providing inexorable momentum, cast each as you will: man and woman, earth and heaven, body and soul, shadow and light. The orchestration of the slow movement seems to write into the score not only the notes themselves but their resonance: an opening trumpet call is followed by a mournful song for the cellos, and each leaves behind an afterglow of glittering harp and piano. After this introduction, the movement proper begins, with a sensuous lapping sea of pulsing strings laid out beneath a sky spangled with oboe and clarinet. Where the first movement showed the influence of neoclassical Stravinsky on Tippett, here the throbbing wash of string-waves seems firmly in a British tradition, irresistibly reminiscent of the ‘Moonlight’ interlude from Benjamin Britten’s Peter Grimes (1945), or of the accompaniment to the first of Elgar’s Sea Pictures, ‘Sea Slumber Song’ (1899). Slowly the tide goes out, and the movement is finally stilled by a quartet of horns. Third comes the scherzo, a rival for Beethoven in being, to use Wagner’s phrase, ‘the apotheosis of dance’. A fiendish violin solo spins like a whirling dervish out of a rhythmic maelstrom, different time signatures flashing past, before the string section entire leads the whole orchestra into joyous climax. Instruments gradually leave the floor: a harp and piano valiantly duet, a brave flute tries to start the whole thing up again, but the attempt is short-lived, and the movement finishes with a few last bubbles from the clarinet and a gurgle of bassoon. The finale was composed under pressure, the BBC Symphony Orchestra’s deadline for the piece having passed. It is a fantasia, composed of four unrelated sections laid out next to each other with an almost jarring lack of transition. A short percussive introduction leads to a brilliant set of variations over a ground bass. Brass fanfares, half terrifying, half exultant, peal out over sharp blasts of timpani-fire and snare drum. 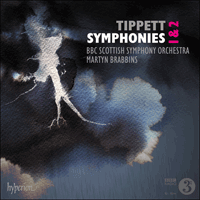 In the third section the strings unfurl the long lush ribbon of melody that had become Tippett’s speciality, beginning with violins at the heights and moving down through nearly six octaves, with tripping triplets in the woodwind guiding the way. The fourth section is made up of one passage, a brass build-up that sends the strings whirling in ecstasy. This passage, with Tippett’s characteristic generosity of spirit, is repeated (with variation) five times, forming—in the composer’s words—five ‘gestures of farewell’. Below it all the piano and timpani have returned the piece to its opening bedrock, seeming to fasten the tonality in the secure white granite of C once again, though tipped into mystery by the final chord, which is haunted by the ghosts of D and A major—the symphony finishes where it began, while forgetting nothing learned, and seeming to usher in new possibility, the promise of further wonders, in Tippett’s third and fourth symphonies yet to come. Michael Tippett (1905-1998) avait presque quarante ans quand il acheva l’œuvre connue aujourd’hui comme sa «symphonie n° 1». Pour donner un bref aperçu des premières années de sa longue vie, il passa une enfance aisée au plus profond du Suffolk dans un confort interrompu par une succession de coups du sort, en particulier la Première Guerre mondiale, qui ruina les finances familiales. La scolarité de Tippett fut assombrie par des sévices sexuels que lui firent subir des garçons plus âgés que lui et par une prise de conscience croissante, même à l’adolescence, que—homosexuel, pacifiste, de gauche—il nageait à contre-courant de la société dans laquelle il était né. Il s’inscrivit presque par hasard au Royal College of Music, non pas en raison d’une quelconque aptitude musicale innée, mais avec la volonté de répondre aux bouleversements politiques et psychologiques par le biais de l’art. Il décida néanmoins de maîtriser l’art de la composition et il y parvint, mais seulement après un long apprentissage. Une carrière médiocre au Royal College of Music l’amena, deux ans après l’obtention de son diplôme et déterminé à surmonter ses faiblesses, à une autre période d’étude du contrepoint. Il n’avait de sympathie ni pour l’école pastorale de Vaughan Williams en Angleterre, ni pour les techniques sérialistes émergeant de Vienne. Encore inconnu comme compositeur et gagnant mal sa vie en tant que chef de chœur, il se consacra à l’élaboration de son propre langage musical. En 1933, après avoir essayé en vain à deux reprises d’écrire une symphonie, il acheva sa symphonie en si bémol, dans laquelle ressort clairement sa passion pour Sibelius. Peut-être trop clairement, pensa Tippett par la suite qui finit par retirer cette œuvre. Peu après la symphonie en si bémol, son quatuor à cordes n° 1 (1935) révéla pour la première fois et dans toute son originalité le galop rythmique séduisant de sa voix mature en matière de composition, alliant un côté revêche qui évoque Bartók et le jeune Stravinski aux syncopes du jazz et aux techniques de la musique de l’ère Tudor et de la Renaissance. La symphonie n° 1 fut créée par l’Orchestre philharmonique de Liverpool, sous la direction d’un Malcolm Sargent mal préparé, le 10 novembre 1945. Mais elle eut peu d’impact et, en fait, elle fut jouée moins souvent pendant les années qui suivirent sa composition que ce ne fut le cas de la symphonie en si bémol. Au cours des onze ans qui s’écoulèrent avant que Tippett compose une autre symphonie, il acheva l’opéra qu’il désirait écrire depuis longtemps, The Midsummer Marriage (1946-52). Cet ouvrage est depuis lors considéré comme un chef-d’œuvre, mais une première production regrettable suscita des critiques franchement contradictoires et une certaine idée commença à circuler selon laquelle Tippett n’était qu’un amateur incompétent. Dans sa musique, les effets originaux que les interprètes suivants ont triomphalement compris furent ignorés car on les considérait comme les preuves d’une mauvaise technique et d’un manque d’oreille; et le fait que son concerto pour piano (1953-55) fut déclaré injouable par plusieurs interprètes éminents (même si, lors de la création, le pianiste Louis Kentner avait appris par cœur la partie soliste) ne facilita pas les choses. C’est dans ce contexte que fut composée et créée la Symphonie n° 2 (1956-57). Adrian Boult dirigeait l’Orchestre symphonique de la BBC lors de la première exécution, le 5 février 1958. Au bout de quelques mesures, l’exécution fut interrompue et Boult—qui en assuma vaillamment la responsabilité—dut recommencer. Le violon solo de l’orchestre avait trouvé la notation de Tippett excentrique et, entre la dernière répétition et le concert, il avait regroupé les parties de cordes, intervention à laquelle on a attribué depuis lors cet incident. En écoutant minutieusement un enregistrement d’archive de la première, il semble qu’une entrée prématurée de flûte, donnant un point de repère erroné, entraîna la totalité de l’orchestre dans un véritable effondrement et menaça de démolir la réputation de Tippett. Mais les souvenirs de la désastreuse première doivent s’estomper face à l’œuvre elle-même, dont la réputation fut revalorisée par le grand défenseur de Tippett qu’était Colin Davis. Comme celle qui l’a précédée, la symphonie n° 2 de Tippett est conçue en quatre mouvements que le compositeur, encore plongé dans son attachement d’après-guerre aux manifestations de jubilation et de renouveau, lia chacun à un état spécifique: joie, tendresse, gaieté et rêve. Cette symphonie est une œuvre annonciatrice, pleine de l’exubérance rythmique et de l’exultation richement orchestrée des univers sonores qu’il avait fait siens dans The Midsummer Marriage, mais déjà tendue avec les composantes plus tranchantes d’œuvres futures comme son deuxième opéra, King Priam (1958-61). L’écoute d’un passage de Vivaldi avec des do martelés à la basse marqua pour Tippett «le moment précis de conception de la deuxième symphonie». Et donc, dans le premier mouvement, le premier sujet fait irruption avec un fort battement de croches sur un do à la basse (auquel l’adjonction d’un piano donne un éclat percutant). Des cordes tournoyantes font alors irruption au-dessus, résolument accentuées sur le «mauvais» temps. Comme c’est souvent le cas chez Tippett, ce genre de maladresse apparente donne à la musique un caractère dansant au lieu de la faire avancer tant bien que mal. Un second sujet survient, confié aux bois élégants et élégiaques, illuminé par le célesta comme les étoiles d’une fée Dragée. Les deux sujets sont collés l’un à l’autre et entrecoupés dans le cadre d’une forme sonate globale, et ils construisent un dialogue de contrastes fréquent dans la musique de Tippett, la friction qui survient entre eux créant un élan inexorable que vous pouvez décoder à votre choix: homme et femme, terre et ciel, corps et âme, ombre et lumière. L’orchestration du mouvement lent semble inclure dans la partition non seulement les notes elles-mêmes mais leur résonance: une sonnerie de trompettes initiale est suivie du chant mélancolique des violoncelles, laissant chacun derrière eux les dernières lueurs d’une harpe et d’un piano scintillants. Après cette introduction, commence le mouvement proprement dit, avec la mer clapotant et voluptueuse des cordes vibrantes disposées sous un ciel pailleté de hautbois et de clarinette. Là où le premier mouvement a montré l’influence du Stravinski néoclassique sur Tippett, ici le clapotis vibrant des vagues aux cordes semble bien inscrit dans la tradition britannique, faisant irrésistiblement penser à l’interlude «Clair de lune» de Peter Grimes (1945) de Benjamin Britten ou à l’accompagnement du premier volet des Sea Pictures d’Elgar, «Sea Slumber Song» (1899). La marée descend lentement et le mouvement s’apaise finalement sur un quatuor de cors. En troisième lieu vient le scherzo, un rival pour Beethoven car il s’agit de «l’apothéose de la danse», pour reprendre la phrase de Wagner. Un solo de violon diabolique tourne comme un derviche tourneur, émergeant d’un tourbillon rythmique avec différents chiffrages de mesure qui passent comme des éclairs, avant que toute la section des cordes entraîne l’ensemble de l’orchestre vers un joyeux sommet. Les instruments quittent peu à peu la piste: une harpe et un piano jouent vaillamment en duo, une flûte courageuse essaye de tout recommencer, mais cette tentative ne dure pas longtemps, et le mouvement s’achève sur quelques ultimes glouglous de clarinette et un gloussement de basson. Le finale fut composé sous pression, la date limite fixée par l’Orchestre symphonique de la BBC pour cette œuvre étant dépassée. C’est une fantaisie, constituée de quatre sections sans rapport les unes avec les autres, avec un manque de transition presque discordant. Une courte introduction percutante mène à de brillantes variations sur une basse obstinée. Des fanfares de cuivres, à moitié terrifiantes, à moitié triomphantes, retentissent sur des grondements de timbales en feu et de caisse claire. Dans la troisième section, les cordes déroulent le long et riche ruban mélodique qui était devenu la spécialité de Tippett, commençant avec les violons sur les hauteurs avant de descendre sur près de six octaves, avec des triolets trébuchants aux bois qui montrent la voie à suivre. La quatrième section se compose d’un seul passage, une accumulation de cuivres qui lancent les cordes dans un tourbillon extatique. Ce passage, avec la générosité d’esprit caractéristique de Tippett, est repris cinq fois (avec variation), formant—selon le compositeur—cinq «gestes d’adieu». En dessous, le piano et les timbales ramènent le morceau à son fondement initial, semblant fixer une fois encore la tonalité dans le granit blanc de do majeur, malgré le mystère qui émane de l’accord final, hanté par les fantômes de ré et la majeur—la symphonie s’achève là où elle avait commencé, sans rien oublier de ce qui a été appris, et semble annoncer quelque chose de nouveau, la perspective d’autres merveilles, dans la troisième et la quatrième symphonies que Tippett allait composer ultérieurement. Vierzig Jahre des langen Lebens von Michael Tippett (1905-1998) mussten vergehen, ehe der Komponist das Stück vollenden konnte, das man heute als seine Sinfonie Nr. 1 kennt. Tippett verbrachte im tiefsten Suffolk eine Kindheit im Wohlstand, die jedoch auch von traumatischen Erlebnissen getrübt wurde; dazu gehörte der Erste Weltkrieg, der die Familie wirtschaftlich ruinierte. Tippetts Schulzeit war überschattet vom Missbrauch durch ältere Jungen. Dem Teenager wurde dann zunehmend bewusst, dass er als Homosexueller, Pazifist und Linker gegen den Strom der Gesellschaft schwamm, in die er hineingeboren worden war. Als er sich am Royal College of Music einschrieb, war das fast eine Zufallswahl. Sein Entschluss erfolgte nicht aus angeborener musikalischer Begabung, sondern aus dem Bedürfnis, den politischen und psychologischen Umbrüchen mit Kunst entgegenzutreten. Trotzdem fasste er den Entschluss, das Komponistenhandwerk zu erlernen. Das gelang ihm auch, allerdings erst nach langer Lehrzeit. Zwei Jahre nach seinem glanzlosen Studium kehrte er ans Royal College of Music zurück, um seine kompositorischen Schwächen zu überwinden und noch einmal Kontrapunkt zu studieren. Er stand weder den Pastoralisten um Vaughan Williams nahe, noch konnte er etwas mit den Reihentechniken der Wiener Schule anfangen. Als Komponist noch unbekannt und mit einem bescheidenen Auskommen als Chorleiter, widmete er sich ganz der Ausbildung seiner Tonsprache. Nachdem er zwei Versuche abgebrochen hatte, eine Sinfonie zu schreiben, stellte er 1933 seine Sinfonie B-Dur fertig. Sie ließ die seine Vorliebe für Sibelius deutlich erkennen—zu deutlich, wie er schließlich befand: Er zog das Werk zurück. Doch nur kurze Zeit später zeigte sein Streichquartett Nr. 1 von 1935 erstmals in ganzer Originalität die mitreißende rhythmische Energie seines ausgereiften Stils: eine Kombination aus der Schärfe Bartóks und des frühen Strawinsky mit den Synkopen des Jazz und den Techniken der Tudor-Zeit und der Renaissance. Die Sinfonie Nr. 1 wurde am 10. November 1945 vom Liverpool Philharmonic Orchestra unter der Leitung des schlecht vorbereiteten Malcolm Sargent uraufgeführt. Einen bleibenden Eindruck hinterließ sie kaum; in den Folgejahren wurde sie sogar seltener gespielt als zuvor die B-Dur-Sinfonie. Elf Jahre sollten vergehen, bevor Tippett eine weitere Sinfonie schrieb. In dieser Zeit vollendete er die Oper, die er schon lange hatte schreiben wollen: The Midsummer Marriage (1946/52). Das Stück, das heute als Meisterwerk gilt, erntete bei seiner ersten, wenig geglückten Produktion durchsetzte Kritiken, und allmählich verbreitete sich die Ansicht, Tippett sei nicht mehr als ein ungeschickter Amateurkomponist. Neuartige Effekte, die spätere Interpreten zu glanzvoller Wirkung bringen sollten, mussten als Beweis technischer Mängel und fehlenden Klangsinns herhalten. Da war es wenig hilfreich, dass sein Klavierkonzert (1953/55) von einer Reihe bedeutender Pianisten für unmöglich erklärt wurde (obwohl Louis Kentner, der Solist der Uraufführung, den Solopart auswendig spielte). Im Bewusstsein dieser herrschenden Meinung komponierte er seine Sinfonie Nr. 2 (1956/57); zur Uraufführung am 5. Februar 1958 dirigierte Adrian Boult das BBC Symphony Orchestra. Nach wenigen Takten musste er abbrechen und noch einmal von vorne anfangen lassen, wofür Boult später die Verantwortung auf sich nahm. Der Konzertmeister war der Ansicht gewesen, dass Tippetts Notation der Streicherstimmen allzu unkonventionell sei, und hatte sie noch zwischen der Generalprobe und der Uraufführung anders verteilt; dieser Umstand gilt seither als Ursache des Abbruchs. Hört man sich die Archiv-Aufnahme der BBC jedoch genau an, so scheint der Fehler in einem verfrühten Flöteneinsatz zu liegen, dem sich weitere Stimmen anschlossen, was schließlich zum allgemeinen Zusammenbruch führte—und Tippetts Ruf beinahe endgültig ruinierte. Doch ist die Erinnerung an die katastrophale Uraufführung zweitrangig angesichts des Werkes selber, das Colin Davis, zeitlebens ein Förderer der Musik Tippetts, wieder in sein Recht setzte. Die zweite Sinfonie ist viersätzig wie ihre Vorgängerin. Jedem der Sätze wies Tippett, in der Nachkriegszeit noch ganz dem Ausdruck von Festlichkeit und Erneuerung verschrieben, eine bestimmte Grundstimmung zu: Freude, Zärtlichkeit, Fröhlichkeit und Fantastik. Mit dieser Sinfonie steht ihr Komponist an einer Schwelle: Sie steckt voll rhythmischen Überschwangs und ergeht sich in reichen Klangwelten, die er sich in The Midsummer Marriage erschlossen hatte; doch trägt sie auch die Angespanntheit des härter gefügten Komponierens in Klangblöcken in sich, die künftige Werke wie sein Oper King Priam von 1958/61 prägen sollte. Das Erlebnis einer Stelle bei Vivaldi mit pulsierenden Bass auf der Note C markierte laut Tippett „genau den Augenblick der Konzeption der zweiten Sinfonie“. So beginnt der erste Satz denn auch mit einem energischen Achtel-Puls auf dem tiefen C, perkussiv verstärkt durch das Klavier. Mit ausgelassenen Drehmotiven treten die hohen Streicher hinzu, unablässig die „falsche“ Taktzeit betonend. Wie so oft bei Tippett ergibt sich daraus gerade keine hinkende, sondern eine tänzerische Gesamtwirkung. Ein zweites Thema, graziös und melancholisch, wird von den Holzbläsern eingeführt; die Celesta sorgt für einen Hauch von Tschaikowsky’scher Zuckerfee. Beide Themen werden im überwölbenden Rahmen einer Sonatenform aufgespalten und zergliedert; auf ihnen beruht der Dialog der Gegensätze, der so viele Werke Tippetts prägt und dessen Reibungswiderstand ihnen unaufhaltsamen Vorwärtsdrang verleiht—mag man sie nun als Männlich und Weiblich, Erde und Himmel, Körper und Seele, Schatten und Licht fassen. Die Instrumentierung des langsamen Satzes scheint nicht nur die Töne selber festzuhalten, sondern auch ihr Nachhallen: Dem Trompetenruf des Beginns folgt ein trauervoller Cellogesang, und beide zittern nach in glitzernden Harfen- und Klavierklängen. Nach dieser Einleitung nimmt der Satz seinen eigentlichen Anfang: Wie ein sinnlicher Wellenschlag pulsieren die Streicher unter einem Himmel, an dem Oboe und Klarinette erglänzen. Zeigt der erste Satz den Einfluss von Strawinskys Neoklassizismus auf Tippett, so horcht die Wellenbewegung der Streicher hier offensichtlich zurück in die britische Tradition: Unwillkürlich denkt man an das „Mondschein“-Zwischenspiel aus Brittens Peter Grimes (1945) oder auch an die Begleitung des ersten von Elgars Sea Pictures (1899), „Sea Slumber Song“. Langsam verebbt die Brandung, und vier Hörner bringen den Satz schließlich zur Ruhe. An dritter Stelle steht das Scherzo, das es, mit Wagners Worten, als „Apotheose des Tanzes“ mit Beethoven aufnimmt. Aus einem rhythmischen Strudel erhebt sich wie ein tanzender Derwisch ein hochvirtuoses Violinsolo, und etliche Taktwechsel huschen vorüber, bevor das gesamte Orchester unter Führung der Streicher einen freudigen Höhepunkt anstrebt. Nach und nach verlassen danach die Instrumente das Geschehen: Tapfer duettieren Harfe und Klavier, eine mutige Flöte versucht sich an einer Wiederbelebung, die aber nur kurz gelingt; der Satz endet mit letzten geräuschhaften Wortmeldungen von Klarinette und Fagott. Das Finale entstand unter Zeitdruck, denn das vom BBC Symphony Orchestra gesetzte Abgabedatum war bereits verstrichen. Es ist eine Fantasie aus vier voneinander unabhängigen Abschnitten, die mit geradezu bestürzender Übergangslosigkeit nebeneinander stehen. Eine kurze, perkussive Einleitung führt zu einer brillanten Folge von Variationen über einem Bassthema. Blechfanfaren ertönen halb erschreckend, halb jubelnd über scharfen Salven von Pauken und kleiner Trommel. Im dritten Abschnitt entfalten die Streicher jene langgesponnene, weit ausschwingende Melodik, die zu Tippetts Spezialität geworden war, angefangen von hohen Violinen, legen sie einen Weg abwärts durch beinahe sechs Oktaven zurück, wobei fließende Holzbläser-Triolen den Weg weisen. Der vierte Abschnitt besteht aus einer einzigen Passage, einem Blechbläser-Crescendo, das die Streicher zu wirbelnder Ekstase anstiftet. Diese Passage wird—ein Ausdruck der für Tippett typischen Großzügigkeit—in abgewandelter Weise fünfmal wiederholt und bildet, so der Komponist, fünf „Gesten des Abschieds“. Unter diesen Abläufen sind Klavier und Pauken auf den festen Boden zurückgekehrt und scheinen die Musik wieder in weißem, granitenem C-Dur zu verankern. Doch auch dieses kippt im Schlussakkord ins Geheimnisvolle, in einen Klang, der auch nach D- und A-Dur zu horchen scheint. Die Sinfonie endet, wie sie begann, und vergisst doch nichts von dem, was geschehen ist—als wollte sie sich neuen Möglichkeiten öffnen und dem Versprechen ungeahnter Wunder nachjagen, die mit Tippetts 3. und 4. Sinfonie folgen sollten.